They watch... from the salons of the rich to the darkest corners of the tenements, the city plays host to countless organisations, each with their own agenda, battling in a shadow war for supremacy beneath the cover of the smog-filled streets. These groups range from the ancient to the new, from political activists to cultists worshipping dark gods. Their members are from all walks of society. Gentleman and scoundrel rub shoulders in their secret meetings. 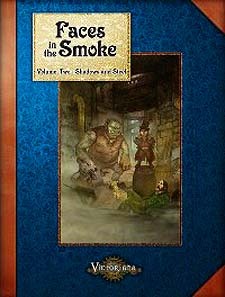 Watch your step as you cross the smoke-shadowed streets - the next person you meet could be one of them. But will they be an ally or an enemy?